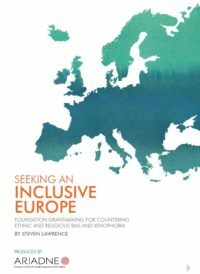 Seeking an Inclusive Europe: Foundation Grantmaking for Countering Ethnic and Religious Bias and Xenophobia is the first-ever study of the philanthropic community’s response to ongoing discrimination and increasing violence and the need for greater cultural understanding, inclusion, and equity. It enables foundations active in addressing bias and promoting social change and rights across Europe to understand their grantmaking priorities in the context of the larger funder community. For foundations that want to become active, it offers numerous examples of approaches funders are taking to address these issues. The report was written by Steven Lawrence, Senior Research Affiliate, TCC Group and supported by Joseph Rowntree Charitable Trust and Open Society Foundations.